Trainer Winky Groover watches as a USDA inspector looks over his horses at the Celebration in Shelbyville. Look at the stacks this horse is wearing (circled). Regardless of the rules regarding soring, how can anyone look at this and not see how abusive it is to expect a horse to move at a fast walk lifting his legs almost to the chest shod in this manner. Two House members introduced legislation Thursday to strengthen laws against soring of Tennessee Walking Horses, but supporters warned that the bill would not be easy to pass. Whitfield and Cohen [U.S. Reps. Ed Whitfield, R-KY, and Steve Cohen, D-TN] announced the bill at a Capitol Hill news conference where they also showed an undercover video aired by ABC News’ “Nightline” that showed horses wrenching in pain because of soring techniques employed by trainers. The new laws would not cost the federal government anything to enforce. “Funding for the increase in inspectors would come from giving the department [USDA] a share of the entrance fees that horse owners pay at shows,” states Barton in his article. While we appreciate some of the sentiments expressed by Sen. Alexander, we are tired of this idea that there are a “few bad actors” carrying out the atrocities connected to horse soring. Even without inspections, photographs and video recordings taken by press and fans alike show horses are being sored. Any horse who performs with an exceedingly high-stepping gait with knees coming all the way up to the chest has been sored or intentionally inflicted with pain on the feet and/or forelegs or they would not move in this freakish manner. Notice the movement of the back legs too, and disposition of the haunches in this video. You will see this is not just happening in Tennessee. What a horror for these horses. As with bull-fighting and bear-baiting, the National Celebration and events like it should be banned outright. 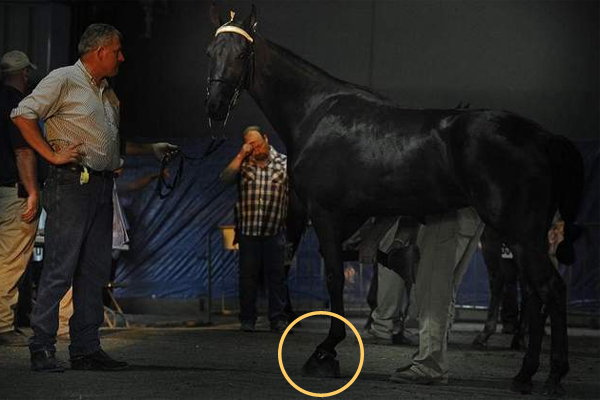 Spot inspections show that even flat shod horses are being sored. Nevertheless, we support the Whitfield-Cohen bill. It will be interesting to see, if enacted into law, what impact it will have on this “traditional treasure” of horse cruelty.